This toner was pretty much of an impulse purchase I made earlier of the year simply because I was swayed by its packaging. It is from the brand Good Virtues Co., a halal certified brand owned by a local company called Satin Straits Snd. Bhd. They centred "Habbatus Sauda Oil" (Black Seed Oil) as their key ingredient. All of their products are claimed to be halal, vegetarian, cruelty-free, and free from alarming ingredients such as SLES, ALES, mineral oil, parabens as well as synthetic colourants. The toner I have here is said to be a "Brightening Facial Toner". I don't think I've ever bought any brightening skincare before, so this is indeed my first experience with brightening product. So.... What it is? How it is marketed? Below is a graphic information taken from their official website. I'm a bit particular with what are inside my skincare. I don't really mind about makeup, but for skincare, ingredients say a lot. I noticed the ingredients written on the official website is slightly differs from the one printed on its packaging. They seem to left out few ingredients and one of it is the Hydroxyisohexyl 3-cyclohexene Carboxaldehyde or also known as Lyral. Do take note that Lyral is one of the popular allergens to skin along with Benzyl Salicylate and Butylphenyl Methylpropional (which also included in the toner). All these are all fragrances or perfumes. It surprised me how the toner has at least 7 different types of fragrances, according to cosDNA, a site that I used a lot to check on ingredients. That's a lot??! And because of the same reason, I was like "Oh no wonder the toner smells so heavily fragranced". I'd describe the scent as herbally. I don't know, maybe because of the Black Seed Oil. It's rather an odd scent which makes me believe a lot of people won't be keen to it. Weirdly enough, I do find the scent soothing. I kinda love it! So let's get down to my verdict. First thing first, I want to say that the toner burns me a lot. Like, A LOT (with uppercase lol). My face, especially cheeks feel irritated as soon as I sprayed the toner. The sensation goes away after few minutes but you know, I need to experience the uncomfortable pain. Dah guna banyak kali pun still burn jugak. Sometimes I just sat in front of a fan until I felt better before proceed with my moisturiser. At this point, I can't even tell if the toner does any job in brightening my whole complexion. I THINK... I mean based on my personal observation, I seem to have an allergic reaction whenever I use a product containing mushroom extraction, so if you're like me, I'd not recommend you using this toner. I also certainly not a fan of the nozzle spray that comes along with the bottle. The spritz comes out directly like jet toner or something and it makes me feel like I've just washed my face over again. Just look at the picture below, I'm sure you can tell by it. The toner is slightly greasy but not sticky. Butylene Glycol is one of the moisturising components and a humectant in this toner and it's high up in the ingredient list. So, I wouldn't be surprised the toner has a moisturising effect. It's colourless as Good Virtues Co. claimed it to be free from any synthetic colourants. The direction is to use after facial cleansing and spritz it over your face and neck area, avoid contact with eyes. Since this toner is not working as a skincare on me, what would I do? Brand : Good Virtues Co.
Well.... as you can tell, I'm disappointed with the toner (especially with the ingredients :/ ), hence I will rate it low. 1.5/5? One point for the packaging and I'll just be going to give another half point for the price. It is affordable. 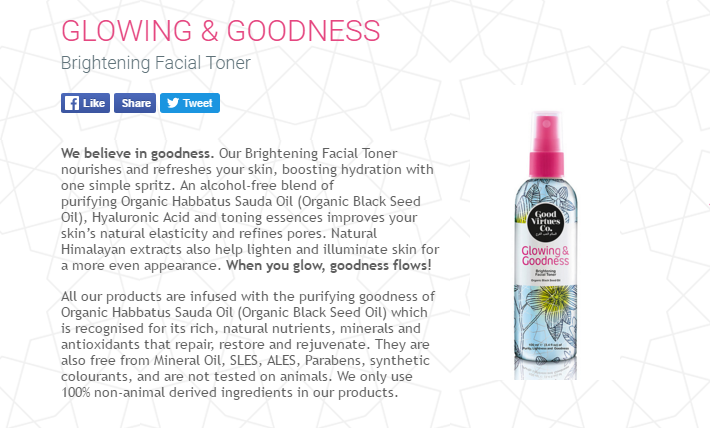 This is the only product I've tried from Good Virtues Co. skincare line, not sure if I'd want to try the rest. On the other hand, their Hair & Body Care products are amazing!! actually d packing so cute and look like face mist.. very difft than other toner actually..
Hi Ayesha! Ah...yes, It kind of bummed me out as so many locals actually hyped about it. Sad it didn't work for me. Not sure about other Watsons, but I wished they provided testers for Good Virtues skincare products. Kalau tahu burning, memang tak beli. Hahah. My skin was freaking out too much, lol so I stopped having this in my skincare routine. I actually always get burns from toner no matter how mild they are, but the sensation usually will stop after several uses as my skin get used to it. This just doesn't! I think one of the fragrances could be the culprit. Yup, my skin begins to tingle instantly each time I use the toner, which is never a good sign :( Oh well, things like this is the reason why I've never really been a big toner person. What's your favourite toner? I just bought this toner and yes I felt the burning and I'm a little concerned because it might be linked to the peeling method for skin brightening. That would really ruin my skin and I realised that my skin has brighten really fast, it's crazy! Its good though...just spray on your face then dab it by our fingers...absorb to our skin very fast. we dont have to waste cotton face too. The smell are good and really inspiring plus the superb benefit of habatussaudah towards our skin...i like it. Thank you for such a detailed review, thank you so much sweetie, keep it up. i've bought the same toner too & sadly the result are the same like you said only it didnt burns but my skin feel irritated and uncomfortable so it would make me scratch my face and ofc that results more acne :( any other than that, do you know other toner that i can use after cleansing my face so it cleans thoroughly and not expensive? I'd suggest something that have AHAs, tea tree oil or salicylic acid in it though, since you said in another comment that your skin is oily. Why not try Cosrx AHA/BHA Clarifying toner or Etude House A.C Clean Up Toner. Is it okay when you spray it after makeup ? Any bad effect tak ? I'd like to try the day cream! and I mostly satisfied with the shampoo and shower bath. Not bad lah for me... hehe. thank you for your suggestion babe!